In every negligence lawsuit in Florida, there are four basic elements plaintiffs need to prove: Defendant owed plaintiff a duty of care, defendant breached that duty, the breach caused plaintiff’s injuries and plaintiff suffered monetary damages (medical bills, lost wages, etc.) as a result. Slip-and-fall lawsuits in Florida, however, are a bit trickier, thanks to a 2010 legislative update that enacted F.S. 768.055. This provision refers specifically to premises liability cases wherein there is a “transitory foreign substance” (something slippery that isn’t normally there) on the floor of a business establishment. This statute modifies the business’s duties when invitees are hurt by transitory foreign substances. It shifts the burden of proof in constructive knowledge negligence actions fully on the plaintiff. More specifically, the proof of the “breach” element here is statutorily constrained to those cases wherein plaintiffs can prove either actual or constructive knowledge on the part of the business owner. 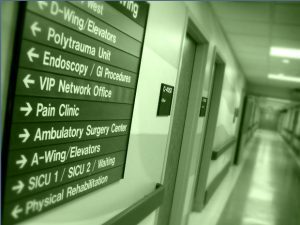 Was Your Hospital Injury Medical Malpractice or General Negligence? Injuries that occur in hospitals are mostly matters of medical malpractice, meaning they stem from substandard care provided by medical professionals. However, some hospital injuries are the result of general negligence (often due to unsafe conditions on the premises). Although hospitals are providers of care, they are also owners of property, with a duty of reasonable care under premises liability law to the general public who enter. This distinction is clear in some cases. For example, a visitor slips-and-falls in a just-mopped hospital lobby that isn’t marked with a sign. Clearly, that incident isn’t a matter of medical malpractice; the visitor wasn’t even being treated. However, when it comes to patients – current, prospective or leaving – the waters can get muddied. A woman who says she was injured in a Hollywood, Florida slip and fall accident at a local gas station is suing RaceTrac for Broward County personal injury. Isaura Velez is seeking damages for injuries she sustained last year. Velez says she was entering the RaceTrac store at S. Pine Island Road when she slipped and fell because no one told her that the floor was wet. RaceTrac is a petroleum conglomerate. This is at least the second South Florida injury lawsuit filed against RaceTrac in the last few months. Susan and Richard Gold filed their Pompano Beach slip and fall lawsuit over his injuries that they contend he sustained when he slipped on gas that overflowed from their motor vehicle’s gas tank. The Golds believe that the pump was defective, which is why it kept pouring gas even though the tank was already full. Richard and Susan Gold are suing a RaceTrac filling station for Pompano Beach personal injury. They claim that a faulty pump at the station maimed Richard in March 2009. In their Broward County slip and fall complaint, the couple contends that because the gas pump was defective, it didn’t stop the gas from flowing after their vehicle’s tank was full. Instead, the gas began “spewing” into the air, onto the ground, and around his vehicle. Richard, who was the one pumping gas, says that he tried to regain control of the nozzle right away because he was afraid of the fire hazard the gasoline posed to him and those around him. The Golds say that this is when his Pompano Beach slip and fall accident happened. Richard believes that if the pump hadn’t malfunctioned, he wouldn’t have slipped and fallen. He also says that the Pompano Beach fall accident caused him to sustain injuries to his neck, head, back, arms, and legs, and he likely has other injuries that have yet to be diagnosed. Every year, hundreds of thousands of people are injured in slip and fall injuries-a type of accident that might sound harmless enough but can result in painfully and debilitating injuries that can take months to recover from. Surgery, rehabilitation, and time off work can take a physical, emotional, and financial toll. Fortunately, Florida law allows victims and their families to seek personal injury recovery from the liable parties. Recently, a jury awarded Todd Flemke $500,000 for his West Palm Beach slip and fall injuries that he sustained at a CVS Pharmacy. Flemke contends that he slipped and fell over a plug in a CVS store. 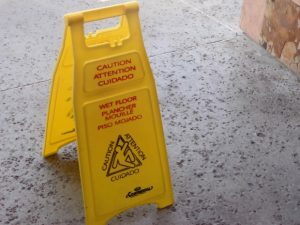 In his Lake Worth, Florida personal injury complaint, Flemke claims that the pharmacy failed to put up warning signs to let them know that cleaning was taking place in the aisle where the slip and fall accident occurred even though underwritten policy calls for caution signs. Flemke had to undergo back surgery after he developed herniated discs from the West Palm Beach fall accident.